In recent days a horde of soldiers and officers from “State Security,” most in plainclothes, who are located in Section 21 (headquarters of “Counterintelligence”), attacked a peaceful group, of which I was a part and that was in front of the police station at Acosta and 10 de Octubre Streets, to support the elderly parents of Antonio Rodiles, whom they advised, in their turn, of the destination and “legal” case for which their son was being kept in the cells of that station. One day earlier, this same horde of criminals, violators of justice and of the most elementary human rights, had assaulted a group of people who peacefully presented themselves at the aforementioned Section 21 together with the attorney Veizant Boloy to inquire about the whereabouts of his wife, the attorney Yaremis Flores, who had been kidnapped from their home by police. Afterwards they took me to spend several days in the dungeons, where I remained without food and water, the only way I had to protest against the violence committed. They released me without charged thanks to the public outcry that resulted from the playing on the Internet of a video recording showing the brutal manner in which they arrested me. Our only “crime” is to think immeasurably about the fate of our country, which for more than five decades has been in the throes of a ghostly and exhausting war, which has only served to devastate a nation and to keep you in power. We have the unquestionable right to choose, to dissent, to gather together, to speak out, to decide what is most necessary for the Cuban nation and its future. We ar its legitimate children, with equal rights, so we demand respect and freedom for those who make up the opposition within the Civil Society in Cuba. Right now, still arbitrarily detained under an alleged crime of “resistance,’’ is Antonio Rodiles, Director of the Independent Project of State of SA (Estado de Sats) and Coordinator of the Campaign For Another Cuba (Campaña Por Otra Cuba), a citizen initiative born in the deep social and economic crisis we are going through which demands the ratification of the UN Covenants, signed by your Foreign Minister on February 28, 2008 in New York City, and that we consider essential rights for the democratic transformation of the Cuban nation and its entry into the community of nations in the XXI century. We therefore demand the immediate release, without manipulated charges, of Antonio González Rodiles, and I demand of you the earliest intervention in the ongoing violations in our country that are committed in your name. Translator’s note: Between the time Angel released this letter and TranslatingCuba.com translated it, Antonio was released. Last Monday they finally decided to open my case to public view after three years of continuous torture and false investigations, after the prosecution withdrew more than five charges that came with the exorbitant sum of 54 years in prison — which with still other charges added another thirty years, so the total would be close to ninety years of imprisonment for me — but some powerful hand decided dismiss them, because they understood that they had not managed to make me afraid and make me quit my blog: The Children Nobody Wanted, and also because international opinion made them look ridiculous. The trial was held in the special chamber of the Tribunal in the neighborhood of Vibora (not coincidentally the name of the reptile “viper”), for “known counterrevolutionaries”; there they also tried Sebastian, the Spaniard who served several years unjustly; the 75 prisoners of the Black Spring, also innocent; and, recently, the U.S. contractor Alan Gross who is serving an unjust prison in Cuba. When we arrived at the court the members of “State Security” were already assembled on the perimeter, in my honor, a peculiar deployment in the style of totalitarian regimes. There were official police cars parked there and some covert interceptions in surrounding the entire area. They also had at the ready the famous paramilitary mobs, the supposed “enraged people” who throw themselves on the Ladies in White and the rest of the opposition, which, according to the official version, “come spontaneously to undertake acts of repudiation,” who looked at us coldly, full of hatred, like the hounds of the ranchers, eager to jump on the escaped slave at an order from the master. As expected, the prosecution presented no plausible or forceful evidence, merely expounding with hollow words, lacking the slightest credibility. The laughable part was when the expert, Lieutenant Colonel, said that, based on calligraphic tests, I was guilty, because of the idiotic detail of the size and angle of my writing. My lawyer asked if the expert if this was a hypothesis, an evaluation; what the officer said was he was 100% sure that I was guilty and that there was no margin for error. That was the “evidence” presented by the prosecution, and, for that reason, the request remained for six years in prison. That is: I will be found guilty only of something as vague and imprecise as the size and tilt my handwriting? I think I’ll be the first writer accused in the history of mankind for writing with “some” tilt, and drawing my letters in a very suspicious size. However, by the Defense presented a variety of witnesses who claimed my innocence regarding the false charges brought against me. 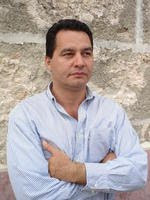 The defense showed, in addition to the lack of knowledge of the literature in the expert, errors in structure, form and fact in the accusations and exposed false prosecution strategies, and its failed attempt to try to trap an innocent person who had convincingly more than demonstrated his innocence regarding the charges against him. The defense also mentioned a number of authors that scientifically demonstrate that calligraphic proofs are not an exact science, and that their results can not be used as “unequivocal” evidence, due to the wide margin of error that exists in every evaluation. According to friends who were present at the hearing, some of them lawyers, former judges and former prosecutors, they said it was a shame that the prosecution presented such an obvious farce, and that, surely, there was no doubt that it had been shown that the charges brought against me had no seriousness. But some assured me that, before starting the trial the decision was already determined, that the verdict is not decided by the judges when there exists, as in my case, a political criterion to decide my innocence or not. Also attending was a representative the “Union of Writers and Artists of Cuba” (UNEAC), and the legal entity representing that institution, who remained at the trial, and said that, from his point of view, they should, without any doubt, dictate my acquittal. Finally it finished with the conclusions for sentencing, which the Judge would dictate in the coming days, but not before warning me that if I did not concur with the opinion, I would have ten days to appeal. I insisted, as an innocent person, that I would not accept even a five peso fine, and that I would serve any time in prison to which I was sentenced, from the first day on hunger strike. Upon leaving the court, one of the agents of “State Security” reported by phone that they did not need to send anyone, that what they expected did not happen, that everything was in order and in tranquility, and no “indisciplines” had been committed. I did not give them the pleasure of abusing those who wished to seek justice for me, and showing their disagreement with government abuses to the opponents of the regime. They were expecting some “indiscipline” as an excuse to beat us. Anyway they saw us marching and their eyes stabbed us in the back. Now come the hours of waiting for the sentence, that will be rendered against the decision of an honest Cuban to inform the world, through his blog, of the abuses committed by the Cuban regime. After the “Cuban government” made me suffer, for more than three years, its new injustice, to the point that, accusation after accusation, the “Prosecutor” asked for 54 years in prison, and then decided not to continue adding more charges such as, “Attempting,” “Threatening,” “Running over a child with my car and hit and run,” and “Harassment,” among the most absurd and improbably like any of those mentioned, and, shamefully and looking for credibility, joined causes for a final request of 15 years in prison against my person. And in the process the file was passed off from the “Provincial Court” to the Picota police station to continue the investigation or to invent false proof, considering they didn’t have the slightest evidence against me, and even after the “Court” again received it and sent it to the “Provincial Prosecutor” for the same reason, and they in turn sent it to the “Attorney General of the Republic” and later to the headquarters of “State Security” in Villa Marista, according to the inquiries of my attorney at each step. All of course without a shred of evidence, but evidently they considered it too exaggerated to remove them all at once. Now the “Provincial Court” should be alerted that these charges were dropped, why do they keep the others being minor and lacking any evidence or witnesses to support them? Why some yes and others no? Who decided what charges are true or false if all are based on someone making accusations without any evidence and having declared that State Security has manipulated them? Is it pure chance that after opening this blog I became the most dangerous and feared criminal citizen in Havana?! Based on these facts it seems that yes, after mounting the police machinery against me, which write in the same file, and where I am portrayed in a note that warns: “of urgent interest of the Minister,” they have had to give up, at least the major charges, those that call for ten years in prison. I am not naive; I recognize that the only thing they are seeking is that I surrender and close my blog, but I think they realized that the more unjust they are with me, the more they inject strength in my will. And if they are preparing the ground for a small sentence to make an example of me, I will reject it the same drive and determination as ever. It seems that “government” now does not know how to get out of it without demonstrating that they were wrong, they built a castle in the air, and, like everything that rises, it falls by its own weight, and my case threatens to drop on their heads. I can only hope that the fate of this fraudulent ship, which like a wounded beast, is giving its last gasps and kicks. My fate, that of justice, is the safe harbor: the ultimate FREEDOM for the people of CUBA. A neighbor told me that the re-involution of ’59 had taken property from owners but had not found a substitute. The director of a business will never be the owner, never have the sense of ownership over what he administers. To illustrate that there are more than thousands or millions of examples, it would suffice to offer a country like this one, worn out, a culture where theft is not seen as a crime because to survive death should not be punishable. 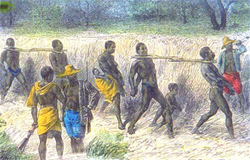 A man who, outside the State work plan of his job as a carpenter, makes a curtain rod to sell it and so is able to guarantee the feeding of his child should not be condemned, although for that he has had to use tools of the State, and to take pieces of wood and laces that do not belong to him. A culture where the concept of “social property” is so foreign and absurd that Marx and Engels would feel so horrified by the result that inspired their theories, that they would not hesitate a second in refuting their communist philosophy. An example of this was when, some days past, a gas station was about to explode in Santiago de Cuba. The video of the events reveals in detail all the ineptitude of the authorities of the place, from their own workers of Cupet, who immediately washed their hands and distanced themselves from the events — that reminds me of “I am returning, Captain,” when abandoning the sinking ship — but the irony of this case was that, thanks to their cowardice, the “Captain” and the workers of the station saved their lives. The irresponsibility of the firefighters can be seen in the video in spite of their arriving before the police. They parked the firetruck near the incident, and got out with the same hurry with which they might have arrived at the beach on a summery morning. They watched, distantly, the events as if they were not any of their concern. They did not run to spray foam, like one supposes they would do in this kind of fire, they established no perimeter security, they just limited themselves to being part of the watching public, like those children nobody wanted filling the tanks of their motorcycles using their helmets, and how the neighbors came with boxes to stock up on precious liquid, at the expense of paying with their poor lives as the price of such imprudence. Of course the inevitable happened, what the least mentally capable person could have predicted from the beginning: The explosion! Everything began with the late arrival of the police authorities. They immediately inspired terror. Looking at it coldly: taking that gasoline from a puddle in the middle of the street was not a crime, it was even — if you will — beneficial, because it would be less liquid spilled. 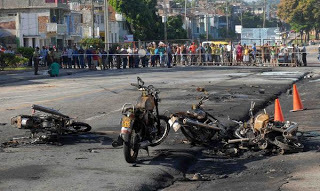 But, as if the rural guard had arrived to distribute machetes, those young men decided to keep their distance, and in a hurry they disappeared, still euphoric for having gotten some gains with no apparent sacrifice, they decided to kickstart their motorcycles, and then, with the first spark they detonated the bomb. That whole group that appears in the video was caught in the fire trap. For the majority it was like the hug of death. The general reaction of the people of Cuba was unanimous and identical: first toward the inactivity of the workers and the Boss of Turno of the gas station at not turning off the electricity in order to so stop the flow of the combustible liquid; then, the uselessness of the firefighters at not assuming, exercising and implementing what is established for those cases; then for the late arrival of the agents of order in their rickety Lada patrol car, which made its entrance like an old cart that comes in search of dead gladiators in the Roman Coliseum. None of these appeared with the quickness required, by the political directors of the Government in order to prevent the fire that approached like the night. It was such a big chain of ineffectiveness, worthy of being received by the Guinness Records (very similar to the tragedy that occurred in the Chernobyl nuclear plant); but the worst of all is how to understand how great is the misery in which our people subsist that it brought the victims to commit such foolishness. That made me think of all the inhabitants of the Cuban archipelago that have launched themselves at sea, aware of such as an act of suicide. We have assumed a culture of danger where “whatever God wants” is the determining phrase that decides our lives. For the majority of Cuban families, it is very normal to have suffered the loss of a loved one in the Florida Straits, there we have spilled millions of tears and prayers for our missing brothers. All the flowers of all the springs of the world will not manage to honor those who offered up their lives in the effort to cross the agonizing ninety miles of sea that separate us from the promised land in search of a liberty so long dreamed of by our people. One of the lessons that the explosion in the Santiago de Cuba gas station leaves is that those people lost their lives for a few liters of gasoline, that is to say: five or six Cuban convertible pesos (CUC), that was the value that they gave them. 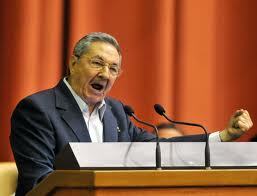 Another lesson is that the ineptitude of the Cuban “Government” was absolute and at all levels. And, if it serves anything, almost with days of differences, to a greater or lesser degree, the explosion in the refinery of Apure in Venezuela, and the gas station of Santiago de Cuba, both events coincide, maybe in an apparent warning from God that with time, Venezuela will become the mirror of Cuba: an ineffective totalitarianism. May God protect Venezuela because in Cuba many Cubans believe that He already forgot them long ago.